On Saturday, Jan. 17, comics enthusiasts and bookworms were invited to celebrate Friendly Neighborhood Comics’ (FNC’s) 6th anniversary. Ernie Pelletier, owner of FNC, invited well-known authors and artists in for signings, while hosting an array of sales on much of the store’s merchandise. Now, he shares the same enthusiasm with his coworkers and customers. Even people unfamiliar with comic books and graphic novels are encouraged to witness the range of publications that FNC has to offer. “I can see for a new person walking in the door, it’s easy to get overwhelmed because there’s so much you could read,” said Pelletier. “The best advice I could give to somebody is just come into the shop and ask somebody—let them know what you’re interested in, and we can find a book for you.” In addition to the avid customer service, the store is outfitted with “shelf-talkers,” cards that identify popular series and provide brief, original synopses by the staff members. As for Pelletier’s personal recommendations, Captain America is his favorite superhero. He noted the successful runs in recent years, such as the adaption of the Captain America storylines to the big screen. 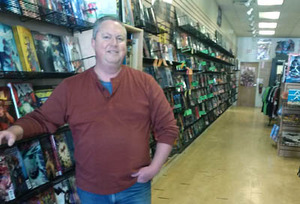 Also, he suggested Manifest Destiny, which he described as “the Lewis and Clark expedition, [where] they encounter monsters out in the American West.” He noted, however, that the renowned Saga series, a work that spans several genres, is one of the store’s biggest sellers. For FNC’s 6th anniversary, Bellingham’s own Amy Bartelloni was invited to the store for signings. She is the author of the successful young adult dystopian novels the Andromeda series. The series’ first novel, Andromeda, was released in May, and its successor, Orion’s Curse, was released in October. Bartelloni hopes to have the third installment published by spring. Comic book artist, writer, and painter Andy Fish was also in attendance to celebrate the anniversary. Fish authors and illustrates issues from several famous comic books series. He recollected a time when his desire was to become a movie director but realized that working with and for people hindered his ability to use his creativity to its fullest potential. That’s when he turned to writing and illustrating. “When you’re a comic book artist, you can do a multi-million dollar movie for the cost of a pencil and a piece of paper, and nobody can tell you it’s wrong,” said Fish. His latest graphic novel, Geeks and Greeks, written by Steve Altes, is about high-tech pranks at MIT. Accompanying her husband was illustrator and painter Veronica Fish. Mrs. Fish regularly submits a variety of featured works to art galleries across the country, and is currently working on the comic book series Pirates of Mars. She expressed her enthusiasm for possibly illustrating an upcoming issue of the famous comic book series Atomic Robo. Finally, Tom Cabral, creator of Cornerstone Creations, was available at the celebration to sign some of his original illustrations. Cabral has an array of talents, including his knack for drawing caricatures, painting murals, and carving wooden crafts. Cabral was a truck driver in his previous occupation, but became disabled. Instead of yielding to his disability, he took it as an opportunity to pursue his true passion and express his creative nature through art. Friendly Neighborhood Comics (www.FriendlyComics.com) is located at 191 Mechanic St./Rte. 140 on the Bellingham/Franklin line.